Odometer goals are relatively uncommon. Most of the time, it's easier to manage the goal as a Do More. A number of the autodata integrations use Odometers behind the scenes, and they're the easiest solution when you can easily access your running total. When should I use an Odometer? Odometers are very similar to Do Mores, but the data needs to be entered a little differently. 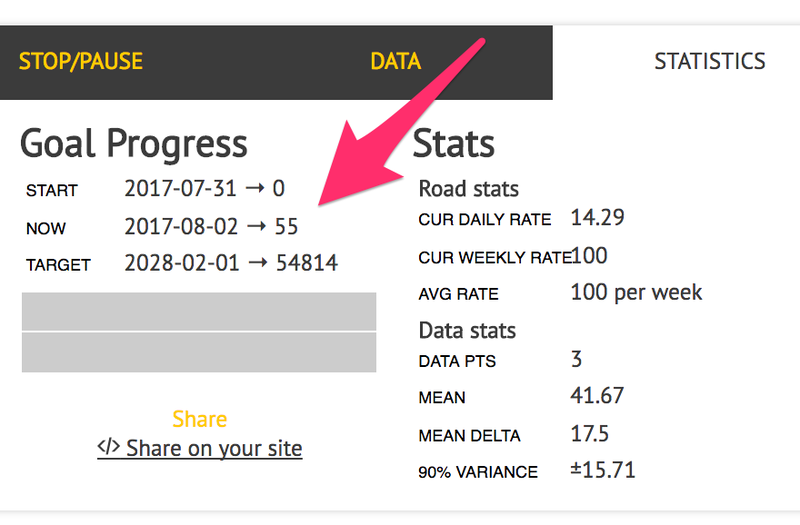 Use an Odometer when it's easier to know your total progress than it is to calculate today's progress, or when the data you're tracking shouldn't be added together over time. Common examples: tracking pages read in a book, year-to-date revenue or earnings, miles ridden on your bike (could be tracked by an actual physical odometer!). How should I enter data for an Odometer? Beeminder needs to know your current total as of each day. Let's say I have a goal to read more often, and I commit to 100 pages per week. I read 20 pages today, putting me on page 20 in my book, so I submit a 20 to my graph. Tomorrow, when I read 30 more pages and get to page 50, I'll submit 50 to my graph. The next day, I only get to page 55, so I submit a 55. And so on. I'm above my road — doing better than my goal rate! Cool. And Beeminder's keeping a running total of all my progress for me, so I know I've read 55 total pages since starting my goal. How is that different than a Do More? The graphs will look exactly the same, but the data you enter needs to be different. I used the example goal above for a Do More example, too — it's the exact same graph and statistics; only the Recent Data tab shows the difference between the two types! What happens if I need to restart my count at 0? Beeminder interprets a datapoint of 0 as a reset of the odometer. After a 0 datapoint has been entered, you can start your page count from 0 again without losing ground. Make sure the 0 datapoint is entered after the last high value and before the new, lower one; order doesmatter for this operation, though that usually isn't true for Beeminder datapoints. All of your statistics will include the total number of pages read across all books, without you having to maintain that count yourself! I'm still confused on the difference between Odometer and Do More. Do More is the right choice almost all of the time, so try that first. If you have questions or objections, contact support, and we'll be happy to recommend a good goal setup for you. Can I switch between Odometer and Do More? Because of the fundamental difference in how Beeminder handles the data, it's usually not easy to change the goal type after it's been created. It's easiest to archive or delete the Odometer goal and start a new Do More. How can I pause my Odometer goal temporarily? This is super easy to do on an Odometer! Using the Take a Break section in the Stop/Pause tab below the graph, first pick the dates that you'll be away, then set the break rate to 0. This will make your road flat at that time, so you don't have to make any progress until it starts sloping up again.